I know that this marriage was short-lived because the bride went on to raise a family with another man, James Victor Wilson, within a few years. The circumstances of the breakdown of the relationship and whether it was officially dissolved is something a mystery. Alice and Frederick appear on the 1901 census at 14 Grant Buildings, Grant Street, Birmingham, the only record I have found of them living together. According to family accounts, the couple had a son, Walter Frederick Mills, who was raised by Alice’s second husband and went by the surname Wilson. According to the registration of his death in California, USA, Walter was born on 23 May 1901 in another country. So his birth should be indexed in the April-June or July-September quarters of that year. The best match on name, Walter Frederick Mills, is April-June quarter birth in the Southwark district. This is not Alice’s son. Of the eleven registrations for babies named Walter Mills recorded in the two quarters, only one was in Birmingham, a Walter Harry F Mills (vol. 6d, p. 63). 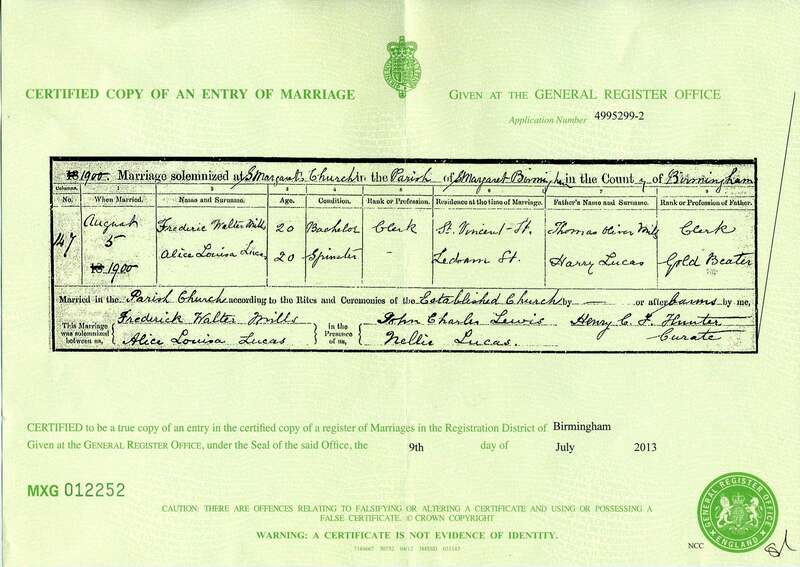 The marriage was certainly over by 1905, when Alice gave birth to James Victor Wilson’s son, James Bertram. A daughter, Alice Irene, followed in 1908. In 1910, James emigrated to America, followed by Alice who sailed on the ‘Carmania’ with his children James and Alice, but not Walter. Taking Walter to another country potentially presented legal issues. Frederick could object and may have had custody. The receiving country may have refused to admit a child without the support of his father. The English 1911 census records a 12 year old Walter Mills, as an inmate of St Josiah Mason’s Orphanage in Erdington, Birmingham. The 1920 United States federal census records Walter F Wilson, aged 18 and born in England, at an army post in Bexar, Texas. The date of his immigration is given as 1912. The 1930 USA census confirms the date of immigration and Walter’s identity as he is recorded with his wife, Clara, at Glendale, Los Angeles, California. By the time of his immigration, Walter was old enough to travel independently, and his best chance of admission into the USA was claiming a relationship with Alice and James. That would be easier to do if he used the Wilson surname. Family accounts make it clear that, as an adult, Walter had contact with his mother and half-siblings, but so far, the evidence suggests that he did not live with Alice and James as a child. What happened to Frederick Walter Mills? I have not been able to identify Frederick in post 1901 records. Between 1901 and 1960, deaths of eight men named Frederick W Mills and marriages of two men named Frederick Walter Mills were registered in England. Similarly 1911 census searches produce many Frederick Mills of around the right age, including four born in Birmingham. Alice’s marriage to her second husband, James Victor Wilson, should provide information on her status, whether she was widowed or divorced. However, I have not found this marriage in the General Register Office index for England and Wales or the Statutory Register index for Scotland. In the 1901 July-September quarter in Camberley, an Alice Mills married William Sibley and a James Wilson married a Mabel Goodman. As these two marriages are on the same page, a search of the GRO index for Alice Mills and James Wilson produces a false positive result. I also drew a blank with divorce records available on Ancestry and FindMyPast. The lack of a record for Alice’s second marriage raises the possibility that no marriage occurred. Could Alice have simply adopted the Wilson surname, but never formalised the relationship? Alice’s immigration and naturalisation status were derived from her husband. According to Alice’s daughter-in-law, she would provide no family history information. Perhaps she was guarding information that could have serious consequences. So, I can’t prove or disprove death or divorce. I suspect desertion, but can’t say who left.